The DaVinci Kalani remains the best mini crib for parents who want a classic look, while the Baby Bjorn Travel Crib Light is still the gold standard for families who are frequently on the go. The Graco Snuggle Suite LX is our new recommendation for buyers seeking a play yard with all the bells and whistles. Parents who want a space-saving, traditional-looking mini crib that won't gather dust after a year or two of use recommend the DaVinci Kalani 2-in-1 Mini Crib and Twin Bed. As its name suggests, this mini crib can become a twin bed with the addition of bed rails. The crib has four mattress positions, comes in a wide range of finishes and has coordinating bedroom furniture. Parents say the pine frame feels sturdy and can stand up to day-to-day abuse. The Graco Pack ‘N Play Playard with Reversible Napper and Changer has the features most parents need and skips the ones they don't, reviewers say. A newborn napper that rests on top of the main play yard flips over to become a diaper changer, a feature parents love. There's also a full-size bassinet and a toy bar. Other highlights include the play yard's push-button fold and wide range of colors and patterns. Some parents simply want a safe, inexpensive play yard for their babies to use for sleep and play, and the Cosco Funsport Play Yard offers just that, reviewers say. The lack of a diaper changer or other bells and whistles keeps both the cost and weight low on the Funsport, which is on the lighter end for play yards at about 20 pounds. That simplicity also translates into easier setup. The Funsport includes wheels so parents can roll it around the house. At just 13 pounds, the Baby Bjorn Travel Crib Light is among the lightest travel cribs on the market, and reviewers say it's also one of the easiest to use. Setting up the crib was a cinch in expert tests, and a durable carry-on-compliant travel case earns raves from frequent flyers. Breathable mesh sides, sturdy construction and a machine-washable crib and mattress cover are among the Travel Crib Light's other standout features, owners say. Some lightweight travel cribs cost more than a full-size wooden crib for home use. Reviewers are thankful that's not the case with the Fisher-Price Ultra Lite Day and Night Play Yard, which weighs just 15 pounds. The crib folds into a carrying case that has a shoulder strap that lets parents keep their hands free during travel. It also features an incline sleeper for younger babies that parents love, as well as a portable changing pad. When space is already at a premium, a mini crib can help parents reclaim some square footage in a small home or crowded nursery. Some mini cribs even fold up so they can be stashed in a corner or a closet, and many come with wheels so they can be moved from room to room. A mini crib may even convert to a toddler or twin bed with the addition of bed rails and, in the case of a twin bed, a new mattress. With many models available around $100, they can be relatively inexpensive compared to full-size cribs. As always, you'll pay more for extra features or a more modern design. Parents who want a traditional, solidly made mini crib highly recommend the DaVinci Kalani 2-in-1 Mini Crib and Twin Bed (Est. $140). This pine crib has gently curved sides and is part of a larger Kalani furniture collection that includes dressers, a changing table and a full-size crib. It's available in white, chestnut, espresso, gray and ebony black. As its name suggests, the Kalani mini crib is convertible to a twin bed with the addition of DaVinci Conversion Rails (Est. $80), but parents will still need to purchase a twin size mattress and box spring separately. Unlike some other mini cribs, the Kalani does not have casters and it does not fold up for storage. Reviewers say the Kalani mini crib is easy to put together with clear directions. Most say it's a great way to save space for babies with small nurseries -- or no nursery at all. The crib measures 40 inches long, 28.5 inches wide and 38 inches tall, and a handful of parents say their children could use the crib until around the age of 2. There are four height settings for the mattress, which parents appreciate. DaVinci cautions against using any mattress with the Kalani not made specifically for DaVinci mini cribs and limits mattress thickness to 5 inches. Parents should discontinue use once their children reach 35 inches tall or are able to climb out -- whichever comes first. All in all, owners say the crib feels quite sturdy, but experts warn that pine can scratch and dent easily. Assembled, the crib weighs 37 pounds and has a slat strength of 149 pounds. There is a one-year warranty. The Dream On Me 4-in-1 Aden Convertible Mini Crib (Est. $125) has attracted a fairly large fan base for mini cribs, typically a niche product. Reviewers say this model hits the sweet spot with a simple, neutral design, affordability, and versatility. It's available in seven finishes – a few more than the DaVinci Kalani – ensuring it can blend with just about any décor. Buyers get to choose from black, cherry, espresso, gray, natural, French white and white. It also coordinates with the Marcus Changing Table and Dresser, but no other furniture pieces. The Aden gets good reviews for ease of assembly, and most parents say the resulting crib is quite sturdy despite weighing only 20 pounds (the Kalani, in contrast, is 37 pounds). It is smaller than the Kalani at 39 inches long, 23 inches wide and 36 inches high, and most parents say it should last at least through early toddlerhood, but not much longer. There are three height settings for the mattress, but no casters to make the crib movable from room to room. The crib does not fold. The Aden comes with warnings not to use a mattress more than 2 inches thick, which is certainly on the thinner side for a crib mattress (for instance, the Kalani allows up to 5-inch mattresses). There have also been a few complaints that Dream On Me mini crib mattresses did not fit snugly enough in the crib -- there should be no gap between the mattress and crib rails, which can pose a suffocation hazard. Parents should discontinue use once their children reach 35 inches tall or are able to climb out, whichever comes first. Weight capacity is 40 pounds, and the warranty is only a month; most cribs come with at least a one-year warranty. If you're looking for something a little more sleek -- and you're willing to pay a little more for a modern design -- check out the Babyletto Origami Mini Crib (Est. $270). The pine crib's clean lines will fit well in any modern home, and it's available in several colors: teal, gray, white, black, pink, and natural. Unlike the DaVinci Kalani and the Dream on Me Aden, the Origami Mini does not convert into a larger bed. However, it does have lockable wheels that allow parents to move it more easily from place to place, and the hinged sides can collapse for easier storage. The Origami Mini comes with a 1-inch mattress pad that reviewers find too thin, and some purchase the Babyletto Pure Core Non-Toxic Mini Crib Mattress with Hybrid Waterproof Cover (Est. $100) as a replacement. For the most part, reviewers say the Origami Mini is easy to assemble, but some say low-quality screws and poorly designed cam locks make for some frustrating moments. But it does get kudos for sliding seamlessly into small living spaces, and reviewers love that it can fold up and roll from room to room. The crib measures 39 inches long, a bit over 25 inches wide and 36 inches tall, more on par with the Aden than the Kalani, though a bit wider. There are just two height settings for the mattress compared with four on the Kalani and three on the Aden. Babyletto cautions against the use of any third-party mattresses in its mini cribs, and says no mattress more than 5 inches thick should be used. It also recommends parents discontinue use of the crib once the child reaches 35 inches or can climb out. Owners say they find the crib sturdy, but some say the paint chips too easily. Like all pine furniture, the wood can also scratch and dent relatively easily. Assembled, the crib weighs 44 pounds -- more than the 37-pound Kalani and 20-pound Aden -- and has slat strength of 149 pounds. There is a one-year warranty. Mini cribs are quickly outgrown, so many parents want an economical option. Reviewers say the Delta Children Portable Mini Crib (Est. $110) is a lightweight, space-saving mini crib that's easy on the wallet. It's available in five finishes: cherry, natural, white, dark chocolate, and gray. Like the Babyletto Origami, the Delta Mini Crib does not convert into a twin-size bed, but it does fold for easy storage and has wheels that let parents move it from room to room. It comes with a 1-inch mattress pad that many parents dislike because it's so thin. Owners say the Delta Mini Crib is easy to put together and to fold for storage, though a few say the directions are a little too vague. When folded, the crib is just 6 inches wide -- a feature reviewers love, especially if they are not full-time caregivers. Some even say they store it under a bed when it's not in use. This mini crib fits through most doorways when not folded. The crib measures 39 inches long, 25 inches wide and a bit over 37 inches tall, and there are two height settings for the mattress. Delta discourages the use of third-party mini crib mattresses, and says any mattress used in this crib should be no more than 2 inches thick. It doesn't appear that Delta makes a thicker mini crib mattress than the one that comes with the crib, however. Parents should stop using the crib when their children reach 35 inches tall or can climb out. Most reviewers are happy with the quality for the price, but some say the finish chips too easily and the board that supports the mattress seems flimsy. Assembled, the crib weighs 35 pounds, and it has a one-year warranty. Sometimes you need something a little less permanent than a mini crib. Portable cribs, often called play yards or pack ‘n plays, can do a little bit of everything. For some families, they're a crib stand-in; for others, they're a place for quick naps and diaper changes. For still more, they're a travel crib for use at grandma's house or in a hotel room. And some parents simply use a portable crib as a safe spot to contain a mobile baby for short periods. Reviewers say the Graco Pack ‘N Play Playard with Reversible Napper and Changer (Est. $85) hits the sweet spot for pack ‘n plays: It has a couple extra features to satisfy most parents' needs, but not so many that they inflate the price. Available in at least nine colors and patterns, it's also easy to find one that matches a nursery or blends in with a living room. As its name suggests, the Graco Pack ‘N Play Playard features a napper and diaper changer that attaches to the top of the main play yard. On one side, the diaper changer has wipe-clean fabric; flip it over and the napper on the reverse side has softer, plusher fabric. There is also a removable full-size bassinet, a toy bar and an included carrying bag. Parents say these features help the play yard grow with their children: The napper, changer and bassinet are most useful for the first few months, while the play yard's main sleeping space lasts many children until around age 2. Like many play yards, the Graco Pack ‘N Play Playard gets mixed reviews for ease of use. While many parents say assembly is easy, some caution that it's time-consuming, and others say the directions are lacking. A push-button fold does make taking it down easier, they say. Most fabric is easy to wipe except for the spot-clean-only fabric on the newborn napper -- impractical given the risk of spit-up and diaper blowouts, reviewers warn. A few also complain that the button that reverses the napper and changer is too stiff, and that the napper and changer are tough to remove when they aren't needed. This pack and play is about 28.5 inches wide and 40 inches long, with sides that are just over 33 inches tall. At 27 pounds, it's just too heavy and bulky for frequent travel, many parents say. Graco says the changing table and bassinet are for babies under 15 pounds, and says babies should be under 15 pounds and unable to roll over to safely use the newborn napper. Parents should stop using the play yard's main sleeping and activity space when children are 30 pounds, 35 inches or able to climb out -- whichever comes first. Graco warns against using third-party mattresses that are thicker or a different size because they can pose a suffocation hazard. Also note that some experts say the newborn napper is too high and plush to be a safe sleep area for babies. Graco maintains that the fabric is breathable and the napper is designed for babies to maintain a safe sleeping position. Parents who want a fully featured pack ‘n play to replace other nursery gadgets and gizmos will want to consider the Graco Pack ‘N Play Snuggle Suite LX – especially if grandma is buying. It comes in two neutral color schemes: dark brown and tan, and dark gray and black. The Snuggle Suite LX isn't short on features: There is a removable infant seat and bouncer with a canopy and vibration that can be detached from the main play yard and toted around the room. An attached diaper changer includes storage for diapers, wipes, and the like. There is also a bassinet that can be removed once baby is too big and needs to sleep in the bottom of the play yard. The bouncer includes music, nature sounds, and a "look light" for when you want a dim light to check on baby at night or do a quick feeding. While parents love the convenience of the detachable bouncer, some say the vibration can be finicky and unreliable. The Snuggle Suite LX can be folded up for travel and comes with a carrying bag, but at more than 34 pounds, it's not exactly a travel lightweight. A few reviewers grouse that the changing station and bouncer won't fit in the travel bag without being completely taken apart. It gets similar mixed reviews for initial assembly, with some owners reporting unclear instructions. The play yard is 28.5 inches wide, 40 inches long, and just over 33 inches tall. Graco caps use of the play yard when children reach 35 inches, 30 pounds, or are able to climb out, whichever comes first. The changing table has a weight limit of 30 pounds, and use of the removable bouncer seat has a limit of 15 pounds when attached to the pack ‘n play and 18 pounds when used separately. Parents should discontinue use of the bassinet when their babies reach 15 pounds or can push up on their hands and knees. As with all of its pack ‘n plays, Graco doesn't recommend using any mattress or padding other than what's provided. Some parents don't need another diaper changer, bassinet or vibrating seat with their portable crib. They simply want a safe, portable sleeping or activity space for their baby or young toddler. Those parents will want to check out the Cosco Funsport Play Yard (Est. $50), a simple, barebones play yard with a low price tag to match. It comes in more than a dozen bright colors and whimsical patterns. The Funsport Play Yard doesn't have a lot to offer in the way of extra features. Like most play yards, it has breathable mesh sides and a thin mattress pad for sleeping. One side of the play yard has wheels to make it easier to move around the house. There is also a carrying case for travel, but no zip-in bassinet, attached diaper changer or napper. Most reviewers appreciate the Funsport's simplicity, saying it translates into greater ease of use. At about 20 pounds, it's still relatively heavy for frequent travel, but parents say setup is quick and easy, especially without having to worry about setting up any accessories. Fabric is easy to wipe, but a handful of parents say the mesh rips too easily. Other quibbles: Some reviewers say a support bar under the play yard makes the mattress pad uneven, while others say the pad is just too hard for everyday use. The play yard is about 28 inches wide and 39 inches long. Cosco recommends that parents discontinue use of the Funsport once their children are able to climb out or reach 35 inches, whichever comes first. The sides are just 28 inches tall -- 5 inches shy of the 33-inch sides on the Graco -- so children may be able to climb out sooner. Like Graco, Cosco recommends against using any kind of third-party mattresses to reduce suffocation risks. For road warriors or frequent flyers, pack ‘n plays are just too heavy and bulky to make them suitable for lots of travel. Travel cribs fill a niche for these parents by shedding extra features (and pounds) to keep things as compact and lightweight as possible. 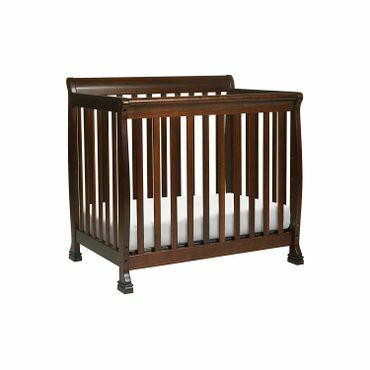 These cribs are also easier to set up and take down, an essential feature for any crib that's frequently on the move. Reviewers say the Baby Bjorn Travel Crib Light (Est. $250) is the ultimate in ease for traveling families: It's lightweight, durable, and a snap to set up, even compared with other travel cribs. The crib is available in at least six colors: black, silver, brown, dark blue, turquoise and pink. Easy setup is crucial in a travel crib, and reviewers say it doesn't get any simpler than the Travel Crib Light. Experts with Baby Gear Lab needed just seconds to set up the crib, which has legs that automatically lock into place. Taking down the crib is easy because it folds up intuitively into a suitcase-like carrier that can be carried on most planes, saving you a checked-bag fee. Together with the carrying case, the Travel Crib Light weighs just 13 pounds. Assembled, it's 44 inches long, 24 inches wide and 32 inches tall. Travel cribs aren't loaded with features, but the Baby Bjorn has a few extra touches that reviewers appreciate. Both the crib cover and mattress cover are removable and machine-washable, and all fabrics are certified to be free of potentially harmful substances such as flame retardants. Parents say the mattress is a bit thicker and seems comfier than is typical for a portable crib. However, some warn that because the mattress sits all the way on the ground, it can be tough for shorter caregivers to bend down comfortably when putting babies in the crib or taking them out. The Fitted Sheet for Travel Crib Light (Est. $30) is available separately. Baby Bjorn recommends the Travel Crib Light for children up to 3 years old or until they can climb out, whichever comes first. There are no weight and height recommendations, but the sides are slanted inward, which may help contain escape-artist toddlers. Baby Bjorn warns against using any third-party mattresses in the crib to reduce suffocation risks. Baby Gear Lab's testers say stability is a strong point. But some parents warn that it's easy for them to trip on the crib's protruding legs, especially in the dark. Reviewers say the Guava Family Lotus Travel Crib and Portable Baby Playard (Est. $198) gives its close competitor, the Baby Bjorn Travel Crib Light, a run for its money with a similar design and a slightly lower price point. 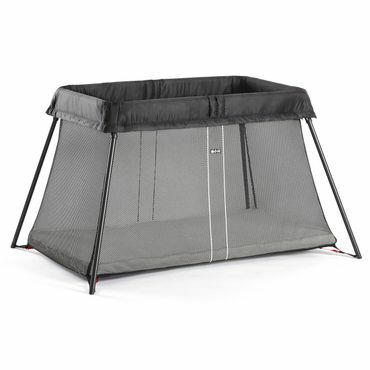 The crib is gray with black mesh, and there are no other color choices. Easy travel is a strong suit here: The Lotus weighs 13 pounds like the Baby Bjorn, and its rectangular carry-on-size carrying case has backpack straps -- a feature parents love, especially when they need extra hands at the airport. Baby Gear Lab's experts say it sets up fairly easily with legs that automatically snap into position, but not quite as easily as its chief competitor, the Bjorn. Closing it was also more of an issue; testers sometimes had an issue fitting it back into its carrying case. The Lotus is 45 inches long, 25 inches wide and 32 inches tall – very similar to the Bjorn. One feature that differentiates the Lotus is a zip-down side panel, useful for parents who don't want to bend all the way down to put their baby in the crib. The mattress is bit thinner than the Bjorn's, reviewers say, and not as soft. Materials are nontoxic and free of flame-retardants, and the crib cover is machine washable. There are several accessories, including sheets, a Bassinet Conversion Kit (Est. $110) and a Fun Shade (Est. $40). The Lotus is recommended for children up to age 3. There is no weight limit unless parents opt for the bassinet, use of which is capped at 18 pounds. The use of third-party mattresses or pads is strongly discouraged. While reviewers say both cribs feel stable, many give the overall nod for durability to Baby Bjorn's slightly higher-quality materials. 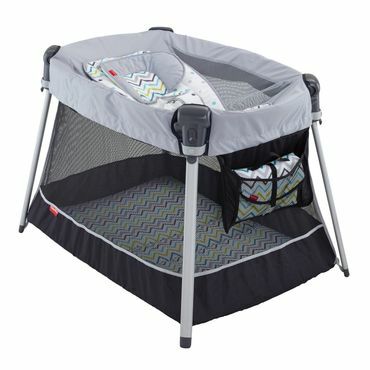 Parents who travel frequently but can't afford to spend $200 or more on a travel crib may appreciate the Fisher-Price Ultra-Lite Day and Night Play Yard (Est. $90). Though reviewers say it's still lightweight and easy to set up, the Ultra Lite is less than half the price of the Baby Bjorn Travel Crib Light and the Guava Family Lotus Travel Crib. It's available in gray with a gender-neutral chevron pattern. Like its more expensive competitors, the Ultra Lite has a carrying case for easier travel. It has a shoulder strap that parents like, but the case is slightly bulkier and isn't carry-on friendly for air travel. At 15 pounds, it's also a couple pounds heavier than the Bjorn and Lotus, but still half the weight of many pack ‘n plays. Hollie Schultz of Baby Gizmo says "there's no tricky business" about setup -- the crib pops open easily and legs automatically snap into position. Assembled, it's about 40 inches long and 27.5 inches tall. 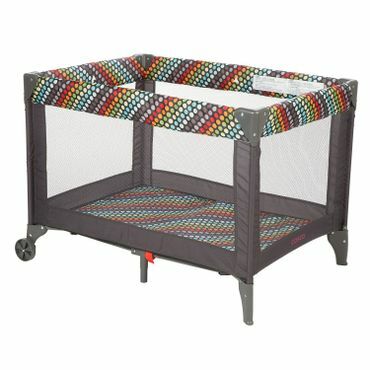 The Ultra Lite comes with an incline sleeper that clips onto the top of the crib frame and has its own machine-washable padding. Reviewers love this feature, saying it's ideal for smaller babies who tend to sleep more soundly at a slight angle. It also includes a portable changing pad that can be stored in a side pocket. The mattress is thin like those found in a traditional pack ‘n play, and some parents worry that it's too firm to be comfortable. Fisher-Price recommends using the Ultra Lite with children who are less than 35 inches and cannot climb out of the crib. Parents should stop using the incline sleeper feature once their babies start to roll over or can pull up on the sides -- typically around 5 months, according to Fisher-Price. Though many reviewers report buying a different mattress pad for the Ultra Lite, Fisher-Price warns against using anything other than the provided mattress pad in the crib to minimize suffocation risks. Baby Gizmo's Schultz says the crib feels quite stable, and reviewers agree that there's minimal risk that it will tip over. While there aren't many expert opinions on mini cribs, expert reviews of portable and travel cribs abound. Some of the most useful sources include in-depth tests from Baby Gear Lab, The Nightlight and Baby Gizmo, as well as roundups based on lots of parent feedback from sources such as Baby Bargains, Baby Center, Lucie's List and Baby List. Most valuable, however, are parents' reviews from sources including Amazon, Target, and Buy Buy Baby. A firm, well-fitting mattress or mattress pad.